Einar Wegener and his wife Gerda seem to have the perfect life, married for six years and trying to have a child. The start of a “game” changes everything as Einar must deal with something that has always been inside of him Lili. Now I will admit that I never really fancied seeing this film but due to the fact the trailer has been attached to every film since well I can remember I decided to give it a try. Probably not the best idea as really cannot buy into Eddie Redmayne’s awful excuse of acting. The story builds up to the first ever attempts of gender changing surgery, but let me warn you it takes a very long time to reach that point. It was however a little bit different to what I expected from the trailer, which makes it seem more glamourous than the whole film actually is. 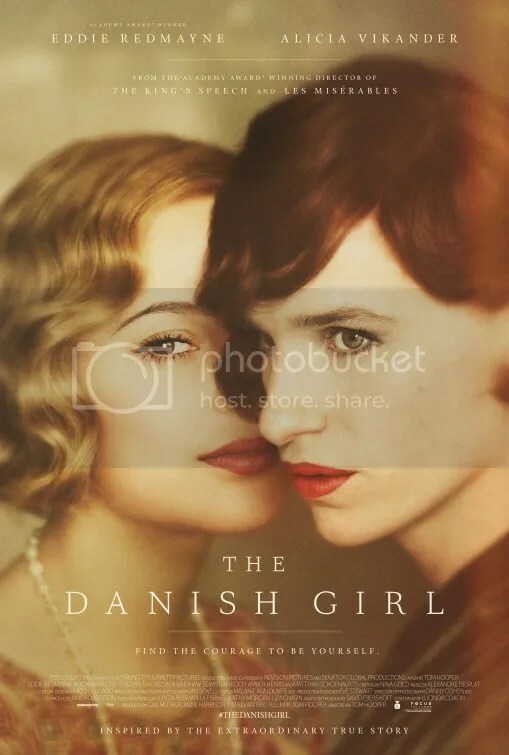 The standout performance from my point of view was certainly Alicia Vikander, she really put across a great range of emotions showing how difficult it was to deal with her husband believing he is actually a woman inside. It comes across as a little bit split personality at one point which I thought made it a little bit more interesting but also strange. As before the joke of Lili and going out for the night dressed like that after posing for a painting, nothing had ever brought that thought up before. Although eventually we are given a childhood story, it just doesn’t fit together very well by that point. It was interesting to see him really start to hate his body and is making himself rather ill by the stress of it all. I will admit though wasn’t expecting a scene with something being tucked away! That certainly was the start of the film heading in a different direction. An interesting part had to be the different doctors basically just thinking he was totally crazy and mad, not really understanding how he was feeling inside. I guess this film has come at a pretty good time considering a lot of talk has been around gender misplacement over the past few years. This has to help show it in a different way and helping others come to terms with themselves? It’s without a doubt Oscar bait but I’m really hoping it doesn’t pick up any awards and very little nominations. It was too boring and lacked emotion in my opinion. Redmayne is not anywhere near as good as everyone seems to think, he’s the same on the talk shows as he comes across in his films. Not impressed by him at all, I know that won’t be a popular statement at all! Not going to recommend this one as feels way too long and drawn out for the story which it does not seem to hit home at all, very disappointing. The Hateful Eight won’t be shown at Cineworld! Agree completely with this review, especially on the film being too dragged out and emotionally empty. Alicia Vikander was terrific though. Really glad you agree with my review and felt the same about the film. It was just a waste of what could have been a good sorry. Was not in a rush to see this even though the trailer did make it seem a pretty glamourous film. The reviews all seem to be along this same line of thinking. Yeah totally they could have done it in a much better way. Actually I should have mentioned some of the incredible shots in Denmark!